I regularly like to post helpful advice for writers. Here’s a tip I thought of sharing today as I get stuck into the second draft of my fourth novel. I find this method of keeping track of my FIRST draft really useful. It may not work for you but may work for those of us who can only function when everything is nicely organised. All writers know that once we have finished the first draft, it is usually in a bit of a muddle. Okay, possibly a huge muddle. Things are happening all over the place. It’s like an encyclopedia of action, plot, emotions all taking place in your head at once, hence, a sheer mammoth of a task to sort out. This is the kind of outline I do when I’ve completed my first draft. 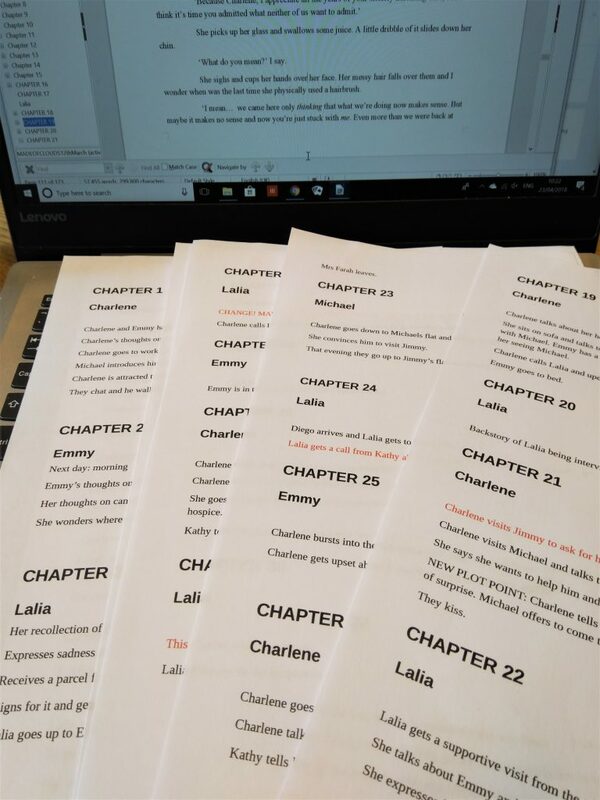 I don’t edit or change anything until I have written a few story beats of each chapter that I have. I create a new blank file where I write up every single chapter headed in bold and the name of the narrator (if it changes per chapter) beneath that. Charlene visits Jimmy. She confesses how she feels about Michael. He advises her. Later in the day she bumps into Michael who is no longer angry with her. He offers to accompany her to the party. She walks home with him but isn’t sure about it. That’s it. That is all I need to know about the direction of the plot and what is happening in that particular chapter in the briefest possible way. I don’t want tons of details, flesh and bones of the story. The point of this list is to cut it all down and keep a record of any ‘structural’ changes to the story … and to be clear in my head on what is happening, and most importantly in what chapter it is happening in. Trust me, life becomes a nightmare when you need to start moving chapters around. If I later add or change a plot point, move or insert a chapter, this list must be updated to reflect my changes. You can always refer to these lists for reference purposes if you prefer to keep backup copies of the changes. As always, do what works best for you and whatever ends up being the most helpful in getting you past the first messy draft and on to an improved second one. I hope you find this tip useful in your editing work.